Stylish Singles – Beds That Is! Whether you are part of a couple that simply prefers separate beds, or looking for something great for a spare room that isn’t quite large enough for a double/king size bed we have some fantastic single beds. It is quite difficult to find high quality single beds, especially in modern designs, so we think our collection is one of the best. They are all 200cm long, so more than suitable for adults too. 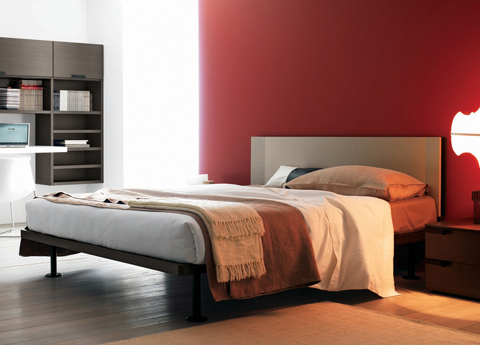 We have a range of upholstered single beds from Bonaldo, a high end Italian manufacturer, that are both contemporary & practical. The range started out as a children’s bed collection, but we are also selling these in grown up colours. As the covers are removable and can be replaced you could buy one for a child & then when your child wants something a bit more grown up just swap the covers over, instead of having to buy them a new bed! The Candy bed below is a great example, it looks great in a children’s bedroom but looks very grown up in different colours – the buttons are optional too. But the best thing about Bonaldo’s single beds is that they have tons of options, & can be set up in different ways, with just a headboard, a headboard & a base board, & a back board as well (or instead of) the headboard. Add matching bolsters & mattress cover & your single bed becomes a sofa, great for a spare room where a pull out double sofa bed isn’t an option. Most of Bonaldo’s single beds can have storage in their bases too, either a lift up mattress support, or drawers, so whether you are using the single bed for adults or children you have got plenty of room to store toys, extra blankets, pillows, spare clothing & more. Finally, many of them can have a second bed in the base (instead of a storage base), a metal framed bed which folds up & is almost a full single size. 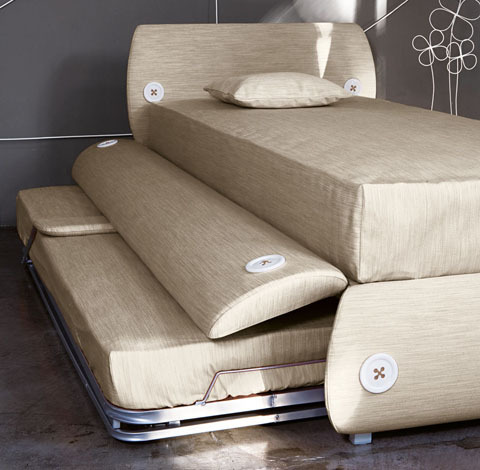 Our other collection of single beds is also made in Italy & was originally designed for teens & children. But as the mattresses they use are either full UK singles, or long European singles they are also equally suitable for adults. These are made in very modern designs, in wood, lacquer or laminate finishes, & are available in a huge range of colours, from baby blue & pink to several shades of very tasteful neutrals. They also have a fantastic matching range of bedroom furniture, designed as systems to provide everything you need in a bedroom – from shelving, desks, spare beds underneath (truckle beds), wardrobes as well as bedside cabinets & chests of drawers. We have put our single beds in their own section – if fact we have sections of king size & super king size beds too, as well as sorting the beds my material (wood, lacquer, upholstered). See our single beds here. Previous PostPrevious Bio Ethanol Fires – Our Winter Heros!